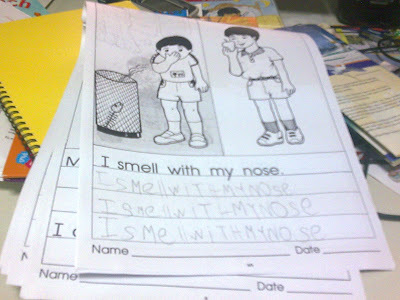 The above 2 pages are from Ryan’s school books. He did it in class during the last term. His school has started on slowly introducing the kids to writing in sentences. 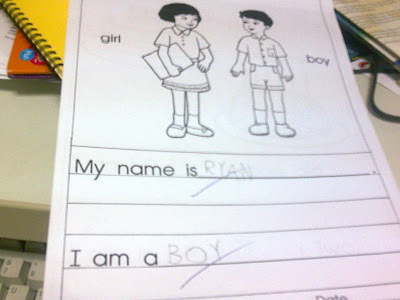 Eg: My name is Ryan. Eg: I am four years old. Through this simple exercise the kids were introduce to sentence structure and what they should be writing about given the topic-Getting to Know Myself. It is easier to start your kid writing on topics that they are familiar with like Myself and my family as it would be easier for them to describe based on their own experience and prior knowledge. It is also a good time to explain to them certain basic rules of capitalization- capital letters are used as the first letter of a sentence, a proper noun, or a proper adjective and for initials or abbreviations. It is definitely beyond their ability to understand the meaning of nouns and adjectives at this stage. However to simply the grammar rules to them I tell Ryan that he should use only uppercase at the start of each sentence and the 1st alphabet to his name instead of writing everything in uppercase as he does now. Tune in to the next post where I share the resources I use to elicit sentences. My kids are taught all of the upper case letters first. So maybe that’s why Ryan likes to use them, perhaps they are most familiar to him. *laugh* my elder one likes to write EVERYTHING in small caps…and he gets rather confused sometimes when he read signs or any words outside the house, when he see something like, “WRITE”, he would ask is that (refering to the ‘I’) an ‘I’ or a ‘L’? cos you know those ‘I’ letters in most ‘signs’ is just ONE STRAIGHT LINE, so to him its rather confusing…luckily he didn’t ask, is that a ‘1’ (one)? Ryan was taught both uppercase and lowercase together. I feel that it’s just a passing fad of his.